In the heart of the Kalahari Desert live a small, strong people with slanted eyes, wide noses and caramel skin. Their slender bodies are adapted to moving through this arid yellow land. Women gather nuts, fruits and roots, knowing what each plant has to offer: food, medicine, dye, building material. The men hunt, mostly antelope, with poison arrows in multiple day pursuits: stocking the animal until they are close enough to shoot, then running after it as it flees, arrow lodged in its body, for days until finally the poison sets in, slows the animal and it can be sacrificed. 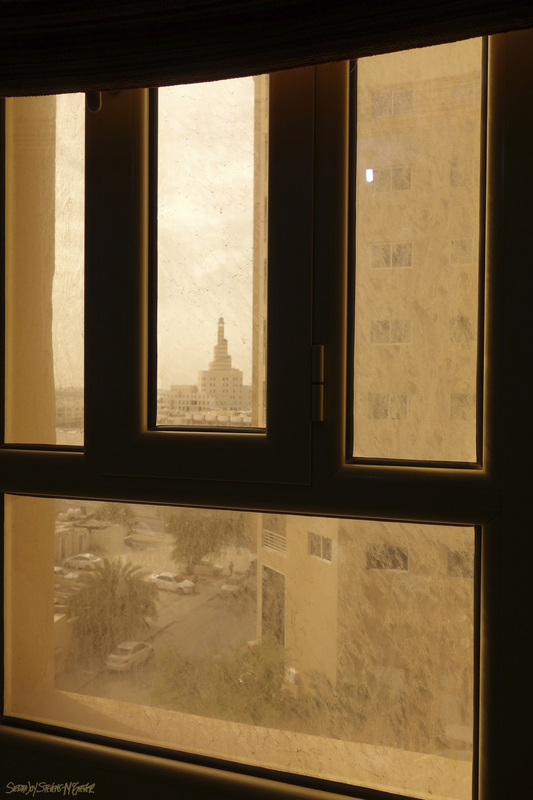 Doha is a dusty city, monotonous and tan. Our taxi driver tells us that the downtown, across the bay has all been built in the last two years. After sleeping in the lobby for an hour we get into our hotel room and sleep for another half hour before our desert tour picks us up. Off southeastern Bali lie the small islands of Nusa Lembongan and Nusa Ceningan and their much larger neighbor Nusa Penida whose landmass is bigger than the bukit peninsula off southern Bali. We are staying in the town of Jungutbatu on the western side of Nusa Lembongan in a villa right on the water and directly in front of two beautiful waves: Shipwrecks and Lacerations. Most of the local people are sea weed farmers. Roughly three inch thick branches are sharpened on one side by hand and stuck into the sand in the shallows inside the barrier reef. Two parallel lines of these branches are set out with rope hanging in between for the seaweed to grow on. These dark rectangular plots make a patch work in all the inland waters and shallow protected coastal areas. 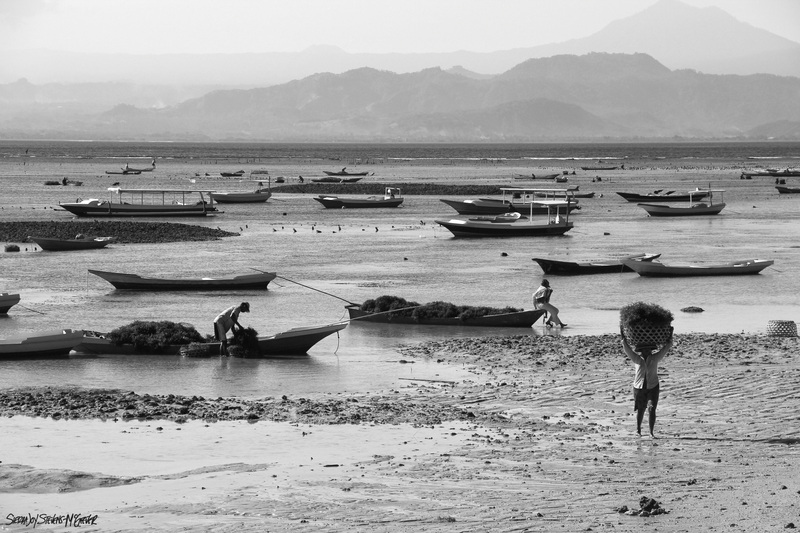 The locals go out at low tide to harvest the sea weed, plant more and maintain the plots. They push motorless boats along with long poles, gather sea weed in vast baskets and in the bottom of their slender boats. When the tide gets exceedingly low the area inside the outer reef looks more like an agricultural field than a beach. My husband is well trained. A friend spotted this bobcat on our drive home from shooting around the lake. I of course freaked out and called “big lens!” My husband had my 400mm out of the bag in the back, and in my hands in seconds! Always a fleeting and special to share a glimpse into the lives of wild animals, and as a photographer its even more special when you can snag a shot. I’ve always loved watching storms—rain, snow, thunder and lightning. But rain at a distance is truly magical. My favorite part of this picture is the fact that the mountains on the left are blurred by an almost invisible sheet of rain we can just see falling into the lake. It got COLD this winter. Water is an amazing substance, it expands when frozen causing it to float, allowing live to thrive below. Snowing again! I know I’m going to miss seeing this view out my window. Savoring winter and excited for spring.